LEN - www.lankaenews.com | Firstly corrupt prison officers should be hanged before prisoners dealing in drugs say law abiding officers ! Cabinet proposal not passed unanimously !! 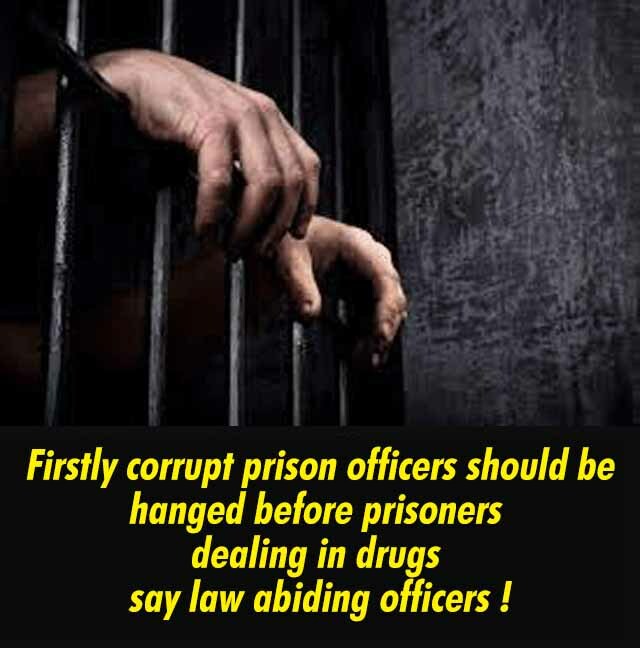 (Lanka e News -13.July.2018, 11.30PM) The proposal made by the president that drug dealers should be executed by the hangman’s noose is a damp squib said the honest law abiding officers of the prison while adding , if the drug trafficking prisoners within the prison are to be executed, firstly the corrupt officers within prison who are aiding and abetting them should be hanged because these drug businesses are being carried out freely and with impunity by the prisoners with the support of these culprit officers. It has come to light the mastermind behind the drug trafficking in the 103 kilos haul of heroin which was seized recently isTharmaraja Susendran alias Suse .The latter who is already in the death row following death sentence meted out to him based on heroin trafficking charges , has filed an appeal against an earlier verdict .President’s proposal to execute drug traffickers of course emerged as a popular solution to the heinous crime. Suse is the closest assistant of Samantha Kumara alias Wele Sudha . Because Wele Sudha has no knowledge of English , his international transactions are handled by Suse. Until yesterday (12) Wele Sudha and Suse had been in two different cells within prison- Wele Sudha in C3 and Suse in L hall. This precluded them from meeting frequently. It is common knowledge that these two dealers carry on drug transactions in collaboration. Despite his on the 11 th , Wele Sudha and Suse were put in the same YO cell meaning that the two drug traffickers can now plan as well as carry out their drug dealings together most successfully . Believe it or not , it is the corrupt criminal prison officers who had helped these two drug barons to carry on their criminal activities without any hindrance. Hence the law abiding prison officers insist that it is these corrupt prison officers aiding and abetting these heroin magnates in prison who should be executed first and foremost . Meanwhile the story that the cabinet proposal of the president in this connection to re introduce death sentence by execution was passed unanimously is a lie, based on reports. This mendacious report has been concocted by the media coolies who are pampering the president and pandering to his dubious agendas. Mangala Samaraweera , Rajitha Senaratne and Field Marshal Fonseka have opposed the proposal to implement death sentence by execution, while the Prime Minister has not expressed his consent. At the same time the SI who nabbed the culprits in this massive 103 kilos heroin haul has been driven into a deep quandary. That is he is threatened with demotion instead of being granted a promotion. This is due to the conspiracy of the superior officers in the Narcotics Bureau at the time of seizing of the drug haul, based on reports..
We shall expose these conspiracies and treacheries via another report.